One of the joys of being the main writer on this site is the fact that there are heaps of stories pertaining to our own players that can populate the site. Unfortunately, oftimes there is simply not the time available to bring readers all of the unique nuances provided by our own players. Today’s Ruck & Maul brings another oleo of achievements. Canada’s NSMT off to South America for ARC test matches. CW’s Barkwill and Buydens will bookend Canada for the upcoming trip to South America for ARC test matches. Kingsley Jones has announced his NSMT for matches against Uruguay and Brazil next month. 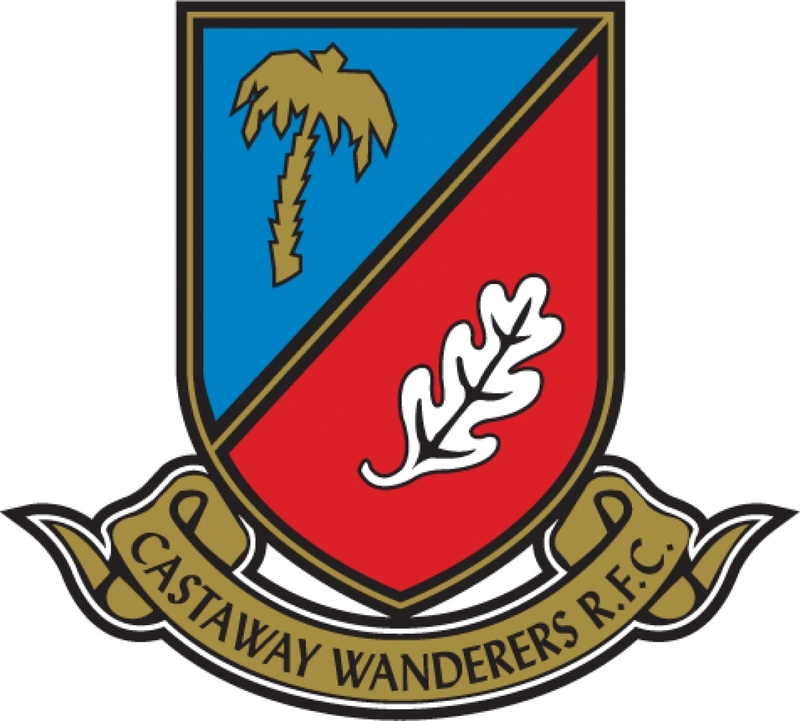 CW throws out kudos to current and recent past chaps who have worn the Tricolours – Dustin Dobravsky, DJ Sears-Duru, Doug Fraser, Ciaran Hearn, Jamie Mac Kenzie, Ray Barkwill and Hubert Buydens. Not knowing who is and who is not in the opposing teams and their relative strengths is an interesting “unknown” against which to test Canadian progress. The overall make-up of the Canadian squad looks rather useful and the Uruguayan outcome, in particular will be most interesting, given their hurdling over our boys to be the America’s #3 contestant at the Big Show! Go, Canada. CW U16 and U18 Girls test themselves against the Province’s best at the recent Elite Youth Sevens Camp. CW’s Jessie Knaggs is fast out of the blocks! 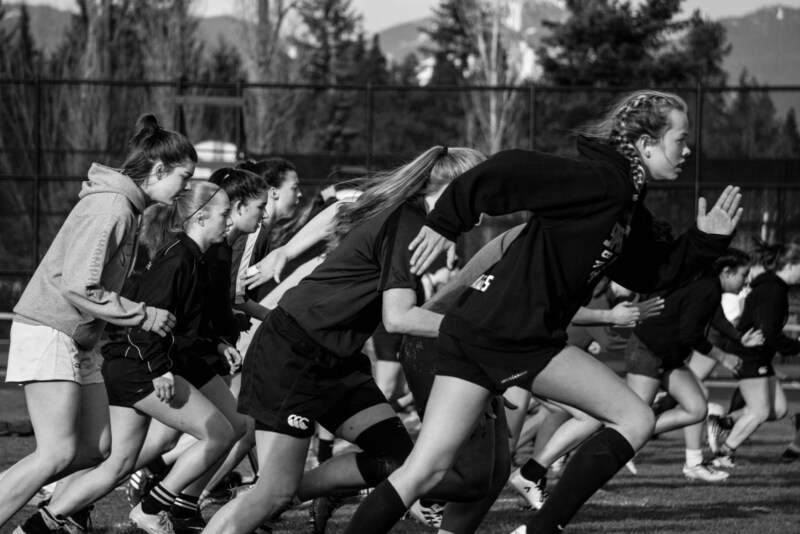 Last weekend saw eighty U16 and U18 girls amassing at UBC and St. Georges, along with their male U17 counterparts to be put through their paces with Elite 7’s training. We bring you a direct quote from the BCRU website as it is pretty impressive stuff! 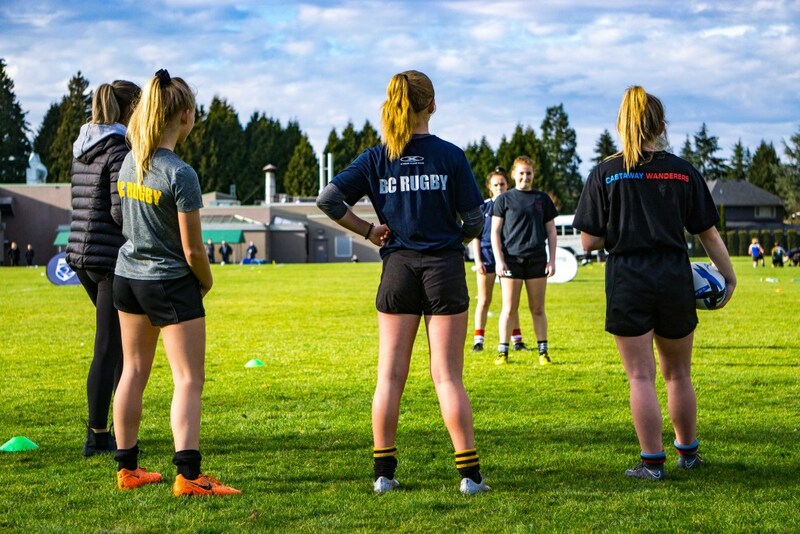 “In coordination with the BC Rugby Conference, which was taking place at the same venue, the U18s were able to get direct coaching from Russell Earnshaw, RFU Coach and co-founder of The Magic Academy. These sessions gave the group some really valuable experience and the players were complimented on their attitude and enthusiasm by Russell and the other coaches. The highlights didn’t end there though, with both age groups receiving an inspirational talk from Leslie Cripps who was being inducted into the BC Rugby Hall of Fame that evening. Cripps, a former captain of the Canadian Women’s Rugby Team who played in three Women’s Rugby World Cups, was bowled over with the number of girls attending the camp, (when she started playing, there was no age-grade girls rugby full stop). The athletes had an array of talent and experience guiding them during the two-day camp. Many past BC Rep Team players and recent Elite Youth Sevens Program graduates were involved in the delivery of sessions. These coaches created a fantastic camp environment for the girls, fostering growth and a love for the game while providing them with great coaching. Brittany Waters and Glen Sharpe were notable lead coaches for the camp, along with many current and past UVic, UBC and UFV student-athletes. CW congratulates the following players in attendance; U16 - Marina Skakun, Jessie Knaggs, Jorja Cook, Gwynnie Fry and Karlyn Schurman. U18's- Sophia Tafel, Katie Hall, Kenzi Farish, Danielle Leipoldt and Chloe Hill-Huse. Gwynnie Fry and Karlyn Schurman tune in attentively. Canada U20 Men to Spain and Portugal. The Portugal/Spain tour is planned for February 13-25 with matches against Portugal on February 17 and 20 in Lisbon, and a U-20 tournament with France, Spain and Portugal in Valladolid on February 23 and 24. Each of the 4 teams will play each other in 50 min games over the weekend. These games will be part of Canada’s lead-up to qualify for the World U20 Championships in Brazil in May. CW offers congratulations to Jarvis Dashquewich who joined CW when he moved to Victoria to attend PISE (Sports School). He was a huge part of our 2107 BC championship team, an outstanding junior flanker who moved to the centres. He has already represented Canada at Junior Commonwealth Games and Maple Leaf 7s. Two former CW age grade stars have also been selected – David Carson, currently studying at UBC was the captain of CW’s Provincial U18 Champs of 2015 and Lockie Kratz, an example of the rugby pathway, he was a huge part of our 2107 BC championship team. Best of luck to these lads and the squad. Go, Canada! Many members of our CW family and other Victorian brethren will be surprised and saddened to read of the recent passing of Al Wood. ‘Natalie’ was a Brentwood grad, rower of note and he returned to help coach at his Alma Mater. On the pitch he packed down alongside the Ox and Lobo, behind Chunger, Flipper, Baby Huey, Bateau and Stobbie; was attached to the Mole, Spice, Buff and Trash. He was part of the Rev Billy Rees Tour to UK and Europe by the Castaways and played in the monumental, Canadian club-side win over a National team when Castaways defeated Belgium in 1978. He fought his health battle as hard as he did with opponents on the field. He trialed a new cancer drug regime bravely and was positive until the end which came sooner than expected. He will join his mates Flipper and Stobbie, in any celestial match going, more likely than not to be “umped” by Jan Curnow. R.I.P., Natalie.